The U.S. City Directories collection from the late 1800s/early 1900s has been a source of entertainment for many hours over the past few weeks. I know, I probably need to get out more, but my recent fascination with the history of the city in which I grew up has hit a fever pitch. 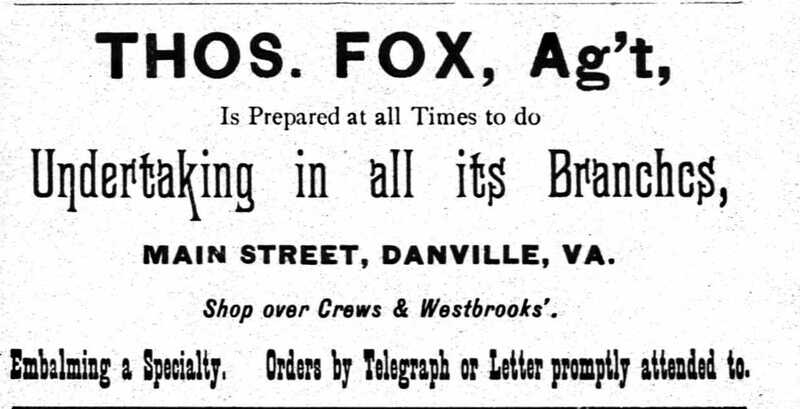 Among the ads were the following from two different businessmen who operated on or near Main Street, which boast products and services that you normally wouldn’t think would go together. Undertaking and wallpaper. Embalming and baby carriages. W.H. Covey & Co. offers “practical embalming” as well as provide a one-stop shop for undertaking, sofas, cradles, and other types of furniture. This ad mentions that Mr. Covey is available any time of day or night above his store front. This T.A. 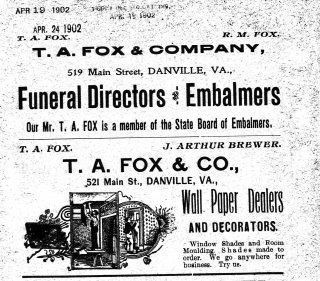 Fox and Company ad has “Funeral Directors & Embalmers” in bold print with an image of a man and woman hanging wallpaper not far below. At this establishment one could find undertaking services or window shades and wall paper. These two ads by Thomas Fox of T.A. 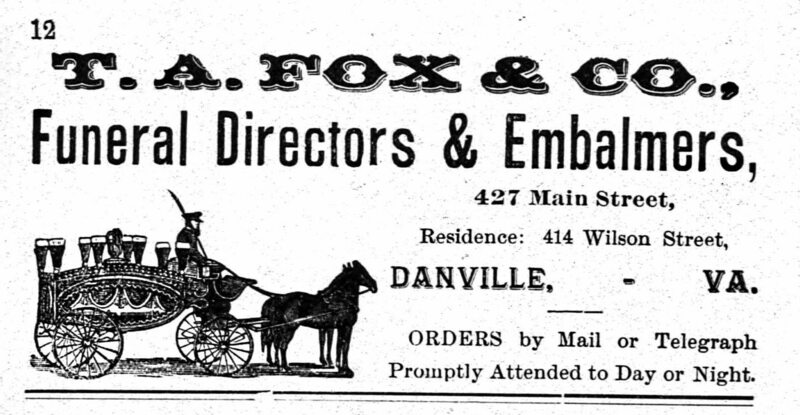 Fox & Co. were focused solely on the funeral side of the business. The second advertisement states that they offer burial robes for gentlemen, women, and children and sell both wooden and metal coffins. Throughout the course of researching T.A. Fox & Co. I read that in 1879 their ad included cabinet making services as well as undertaking. Prior to the time of these advertisements there were no funeral homes as we know them today. When someone died, he or she was clean by the family, dressed in a burial shroud, and placed in a box or coffin made of wood such as poplar, cherry, walnut, or mahogany. Local cabinet or furniture makers often were hired to measure the deceased for the coffin and build it on short notice. Any type of funeral service would be carried out from the home, with burial taking place within 24 to 72 hours of death. This allowed sufficient time for proper respects to be paid as well give the deceased time to awaken or stir if he or she wasn’t really dead but had merely lapsed into a coma. In hot weather, ice buckets were placed around the room where the body laid and ice could be placed inside the box with the deceased to help keep it cooler. Now these seemingly quirky ads make sense to me, although they still remain my favorites of all the ads I’ve seen in the city directories. Reblogged this on Emmy Midnightingale. Previous Previous post: Wednesday’s Child-Jacqueline Burns "Abandoned on Yanceyville Road"